Sometimes there is fever in the air. It can be benign, uplifting and who in the football world could question Jurgen Klopp if, in a moment of immodesty, he claimed authorship of such a phenomenon? Not that he is likely to do this, short of some Jekyll and Hyde personality split. It means that if his Liverpool finally fall short in Kiev tomorrow night, or Cristiano Ronaldo finds again that imperious streak to repel the once extremely unlikely personal challenge of Mohamed Salah, there will still be no good reason to turn Klopp’s picture to the wall. This is because, win or lose on the banks of the Dnieper River, he has pulled off a rare feat amid the manic pressure of the modern game that has become endemic at places like Liverpool and Manchester United and, of course, Real Madrid. Klopp has been true to both himself - and some impressive human values - and, most vitally, a group of players who have fought with nothing less than heart-stirring passion to repay his trust. One of his first important decisions at Anfield said much about his instincts, how they were and not how they might be concocted to suit changing circumstances. No, he was not about to wield a cheque book before looking at the players he had inherited, measuring their strengths and potential to improve as well as their weaknesses. He wasn’t playing some good guy role. He was investing in the lessons of an outstanding career. He passed on the first transfer window - and the treacherous pressure it can place on an embattled manager looking to shore up a weakness or two. Now on the eve of his second Champions’ League final – having lost his first with Dortmund to a last-minute goal by Bayern Munich’s Arjen Robben five years ago – he can point to a £20m-plus transfer balance, with thanks to Phillipe Coutinho, along with such notable signings as Salah, Sadio Mane, Virgil van Dijk, and Andy Robertson. He has brought on Trent Alexander-Arnold so well, implanting such faith and confidence, he has made England’s World Cup squad. The 19-year-old is playing with a relish that says he has been convinced he is more than equal to the job. Van Dijk’s signing in the last window has proved a move of almost stunning certitude. James Milner may be sneered at in Spain for the wear that comes around the age of 32 – except, that is, to the biological wonder Ronaldo - but they cannot have studied too closely the quality of some of his recent performances. All of Milner’s hard-working youth may have not been regained but it plainly remains a lot more than mere memory. Dejan Lovren has been the despair of critics of defence but buoyed by the presence of Van Dijk, he has won Klopp’s confidence that he is indeed a man for a potentially steamy night in the Ukraine. Salah on his own would have illuminated the Klopp years but the manager has also drawn consistent performance of the highest calibre from Roberto Firmino and Sade. When you put the pieces together, the picture has depth and sustained meaning. 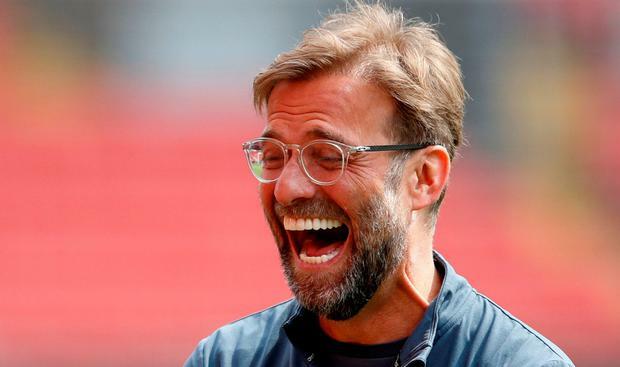 There is, maybe inevitably, a not altogether damning professional opinion that for all his success at Borussia Dortmund and now Liverpool Klopp remains essentially a one-trick pony. But it is some pony, some trick. Indeed, on the way to Kiev at times it has looked like a superb steal at the Kentucky Yearling Sales. Klopp’s great achievement runs deeper than the current success of his high-risk, pressure game that has been so sublimely enforced by Salah with that brilliant assistance and balance of Firmino and Mane. It has been, as it was in his reputation-building, promotion-winning days at his old club Mainz and twice Bundesliga-winners and Champions League finalists Dortmund, to become perfectly attuned to his environment, its hopes and its style. At Liverpool, no less than in the temperamentally similar Ruhr Valley, he has set no limits on himself or his players – or the expectations of fans who see in their team not only a distraction from the rigours of a hard life but something at its core. Beating Real Madrid, who occupy a unique place in the football stratosphere with 12 supreme European titles, including three of the last four, is quite possibly the career-defining test of the 50-year-old who grew up in the bucolic calm of a Black Forest village. But then it can also be said that in at least one aspect Klopp is pretty much proofed against all but the most serious calamity. It is the ineradicable fact that he has already joined the league of great Liverpool managers, Shankly, who didn’t reach the European mountain top but wrote all the enduring ground rules, Bob Paisley, who did it three times, Joe Fagan and Rafa Benitez, once each. Benitez a great Liverpool manager? There might be some argument about this but, as he said with much grace this week, if the victory in Istanbul in 2005, when a superb but over-confident Milan were hauled back from a 3-0 lead, was extraordinary, and in some ways fortunate, it also had the power to change his life and those of his players. He made two concessions in a statement that, in these days of so much self-serving managerial pronouncement, were both impressive and generous. He conceded that Milan, starting with such as Maldini, Pirlo and Kaka, were in quite a few respects the superior force. He also said that Klopp’s team has the edge on the one that conjured the win in Turkey and that, yes, they have the potential to upset Real. They were remarks ungrizzled by time and the mixed fortunes Benitez has experienced since his first triumphs with Valencia and the lightning strike in Istanbul. They said that he too had caught the fever created by the man from the Black Forest. It is one which it is easy to believe will survive most, if not all, the possibilities of the Kiev action.